When it comes to fine dining, Golden Oak Food and Beverage Area Manager Melissa Schreiber is an expert on the subject. Her multi-faceted training and experience, rooted in Disney tradition, has given Melissa an excellent foundation to provide a perfect blend of extraordinary and personalized service at the clubhouse. 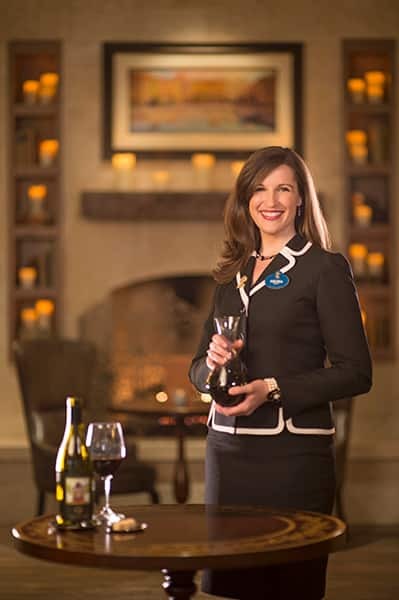 Melissa joined Golden Oak from Victoria & Albert's at Disney's Grand Floridian Resort and Spa, Central Florida's only AAA Five Diamond Restaurant. Melissa has received certification from the Court of Master Sommeliers, is a certified spirits professional, and a certified Cicerone Beer Server. Among her diverse leadership roles at Walt Disney World® Resort includes a position as a restaurant manager at Citricos, a signature dining destination. "Using my experience in both casual and fine-dining environments, I work with our team to provide an experience for our residents that is refined, yet approachable," she said, "while delivering uncompromising levels of service. Melissa partners with Summerhouse Chef, Christian Rumpler, to procure ingredients and offerings that are the best in the industry. Whether it's a great vintage wine, craft beer, or a new culinary trend, the team in the restaurant and lounge is committed to seeking new ways to surprise and delight the residents. "Chef Christian and his team have done a brilliant job creating menus for residents that align with our culinary vision to represent the essence of farm-to-table cuisine," Melissa said. "For example, they choose items at the peak of their growing seasons and combine them with world-class ingredients. And we partner with the team at The Land in Epcot® to incorporate their 'Disney-grown' herbs and vegetables into our dishes. In November, we featured a 'Late Harvest Tomato Soup', made from scratch with tomatoes grown at The Land. Residents love the unique combination of fresh, local, product with a special touch of Disney magic." You'll find several seasonal offerings in Tyler's lounge, too, Melissa notes. "Our team has taken direction from Chef's approach to cuisine to create custom seasonal cocktails, using hand-crafted components. They'll be added to the menu in the coming months." Top of mind for Melissa is to create an environment at Markham's and Tyler's that evokes the charm of Summerhouse, while providing a casually elegant destination for residents to spend time with their families and friends. Whole-heartedly appreciating Melissa's sentiments are Golden Oak residents like Mary Ann. She tells us that her family enjoys dining at Markham's because of the opportunity to meet new neighbors and catch up with the ones they know. They especially love the cuisine and personal service from the Cast Members. "We come to Markham's for a number of reasons, the first being a great meal with exceptional service," Mary Ann said. "We like how the servers remember the family, and take time to talk and ask about things. We also love how Chef makes an appearance to bring our food and ask about how we are enjoying the meal." According to Melissa, delivering the high standards of service set for Markham's and Tyler's requires a very talented team of individuals. "Each of our Cast Members is here because they possess a skill set that is extremely difficult to find — one that combines not only knowledge in the industry, but also a presence that is both poised and personable." Mary Ann said her family notices the special care the entire food and beverage team provides each time they visit. "The team is very involved in making sure the whole experience is pleasurable, and they are always ready to meet or exceed our expectations," she said. "On a recent visit we were informed about an upcoming beer-tasting, but when Wayne (Restaurant Guest Service Manager) learned we wouldn't be in town then, he offered to set up something for us when we return. That's service!" Seeing Residents like Mary Ann and her family enjoy their time in Markham's and Tyler's is what it's all about for Melissa. "The residents of Golden Oak are like an extension of our family, and our team genuinely enjoys being able to develop lasting relationships with them," Melissa said with a smile. "It's an experience like no other I've had with the company, and I am very much looking forward to what the future brings."